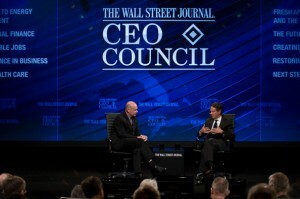 U.S. Treasury Secretary Tim Geithner (R) and Wall Street Journal editor Gerard Baker (L) at last year's Wall Street Journal CEO Council, held in Washington, D.C. on November 16, 2010. On Monday and Tuesday, 120 of the world’s top executives convened at the Four Seasons hotel in D.C. for the annual Wall Street Journal CEO Council. The people assembled represented companies generating a combined total of $2 trillion and employing 5 million people, according to the organization’s website. In addition to CEOs, attendees included lawmakers, policy wonks and former ambassadors. The meeting’s theme centered around China’s role in the global economy, job creation and American deficits. The meeting brought together, in essence, the 1 percent around which the Occupy movement protestors have centered their critiques. And yet, Occupy DC protestors weren’t at the meeting. Occupy DC participant Brandon Darby, a member of the group’s media team, said protestors didn’t know about the meeting. “As far as I know, we didn’t do anything [at the CEO meeting],” he said. Darby said Occupy DC has a committee that focuses on finding events where protestors could get involved. It’s no small task figuring out where to go in a city like D.C., where such events happen very frequently. Protestors probably didn’t hear about the meeting “because a lot of the energy was focused on what was going on in New York,” Darby added. Early Tuesday morning, New York City police cleared Zuccotti Park of Occupy Wall Street protestors, under orders to clean the area. The middle-of-the-night raid outraged protestors around the country. In D.C., protestors spent part of the day Tuesday marching to Brookfield Properties’ D.C. office. The company owns Zuccotti Park. ← Poll: Will More Walmarts Be Good For D.C? Yelling and Acting a FOOL in front of a crowd does not gain supporters. There are local opportunities to network and gain supporters who are tired of the corruption within their ranks and feel as Colin Powell about the Protesters being as American as Apple Pie.The best thing to do is go to meetings like the Commonwealth Club on Dec 8th in San Francisco at the NEWCOMERS meeting and just hang out and understand how they think and network. WE are all Americans and it seems have similar needs and desires. .Eventually one will see the GOLDEN OPPORTUNITY and you will hardly miss it because you will have worked for and had patience for that moment when the impact would be immense to any action.Active listening can bring you audiences.Disarming techniques that are humorous but not tacky if not overused WORK and are great ice breakers.YELLING and Being disruptive hardly works as well as kindness.The THUGS who have arrived to just start trouble with cops at any protest any where and have weapons need to LEAVE Go home before you lose it. WE Do not need violence Sticking to PRINCIPLES that Martin Luther King Jr would approve of for protests works.he would approve of DISRUPTION if the Parties are that HEINOUS in their Own Social interactions and Acts upon mankind .